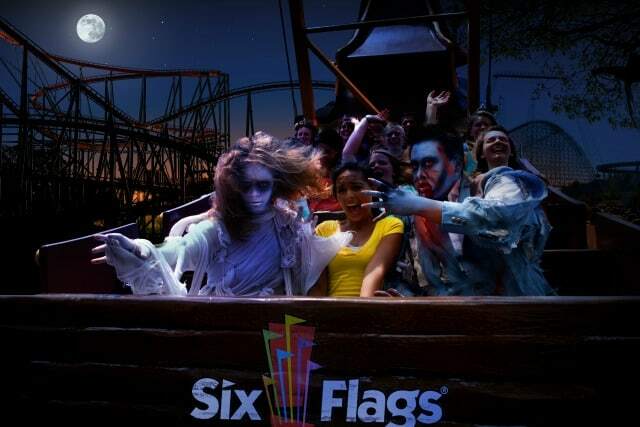 We were invited to get a preview of “Fright Fest” at Six Flags: Great Adventure in Jackson, NJ. 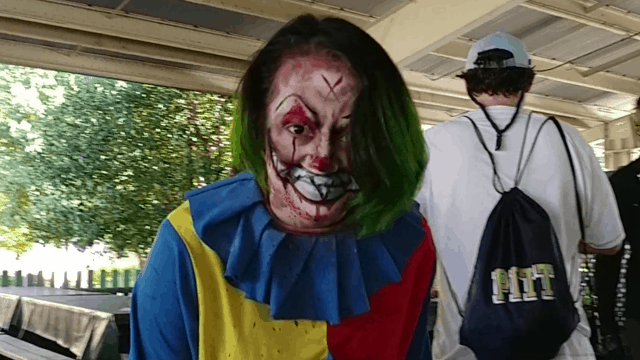 Despite its reputation for intense scares, we took them up on their offer to see how family-friendly their “thrills by day” are. The plan was to do as much as we could while the sun was up and then get out. Here’s how our day went, why we stayed longer than expected, and how we ended up getting more than we bargained for. 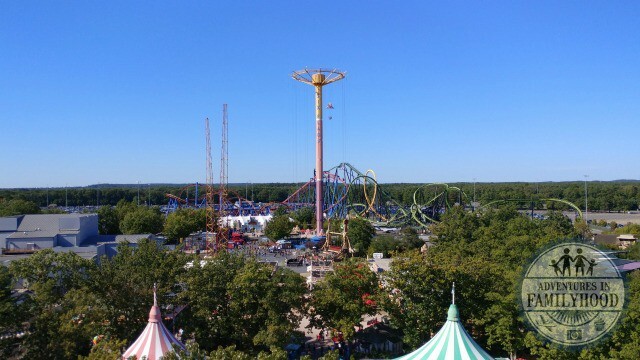 Confession: I hadn’t been to Six Flags: Great Adventure in over 20 years. I have many fond memories of going when I was younger, but I had yet to take my own kids. Fright Fest seemed an odd choice for their first visit. 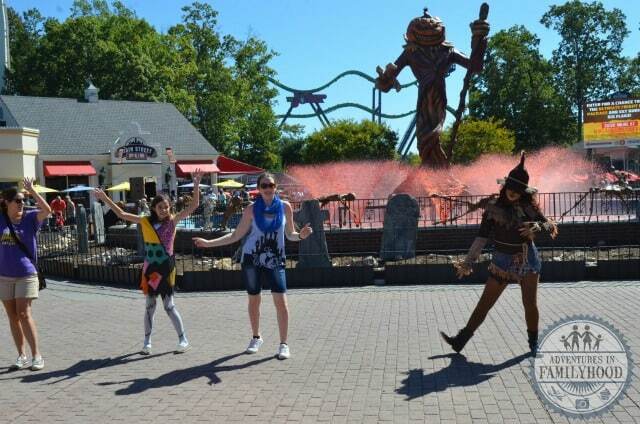 But… the “Fright Fest” media day just happened to be on a day we had available to make the drive out to New Jersey. It also worked out that our niece was on leave from the Navy and we were able to pick her up and take her along with us. 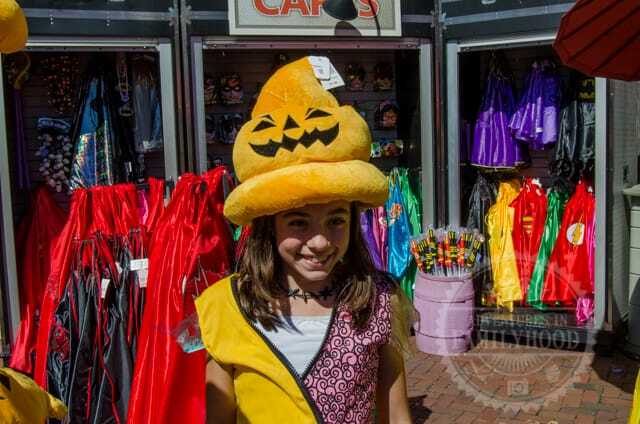 She’d actually be meeting up with her dad and staying for the full Fright Fest experience while we headed home. 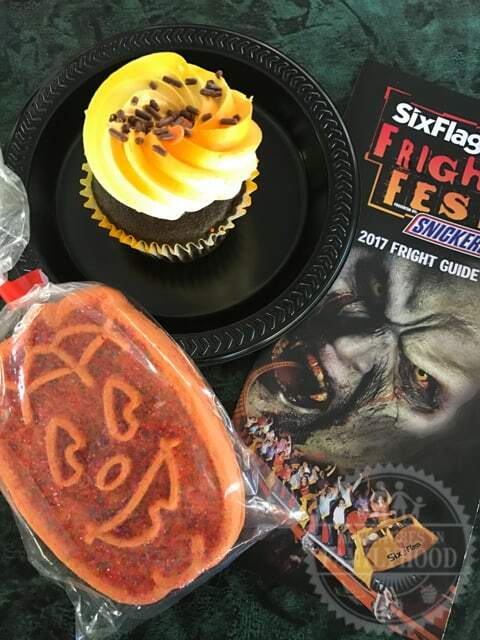 Fright Fest, presented by SNICKERS®, is back for select days September 16-October 31 at Six Flags Great Adventure. 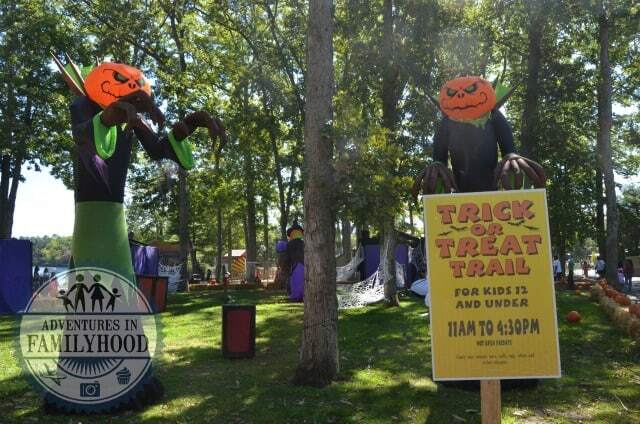 It’s a spooky time of year as zombies and ghouls take over the park. 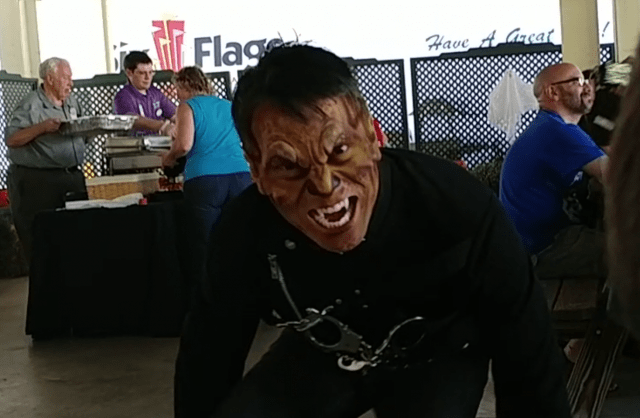 Enjoy thrills and activities for the whole family throughout the day and come back for a truly frightening evening of fun after the sun goes down. 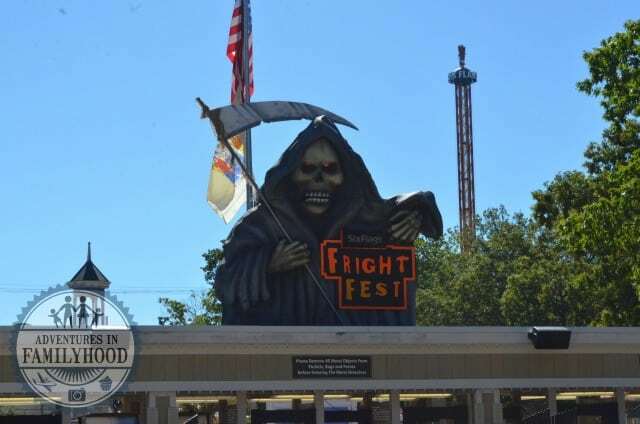 Fright Fest offers a wide variety of places to get your scare on including seven haunted mazes and five scare zones located throughout the park. The stuff of nightmares lurk around every corner as the dark of night washes over the park. The ghouls are set free for their daily hunting rituals. BEWARE! There is no place to hide! 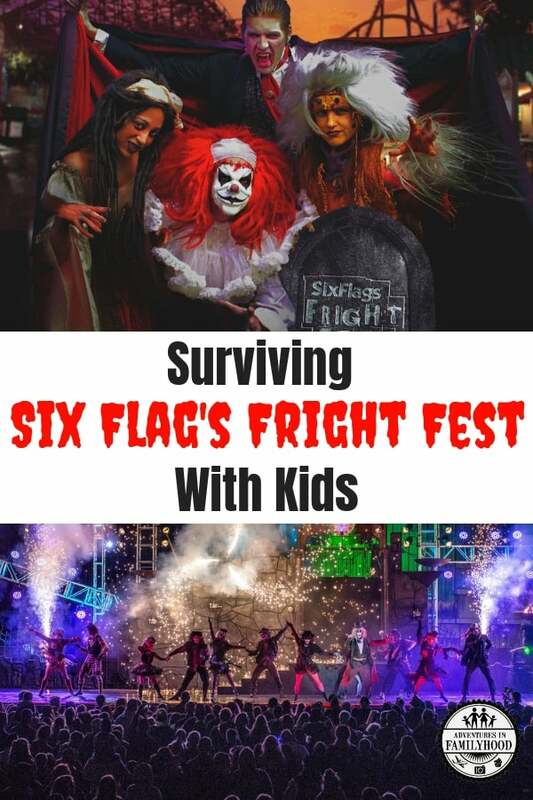 While “Fright Fest” is known for the intense scares it creates at night, there are more family-friendly elements to be enjoyed by day. It was these more tame thrills that we were interested in. 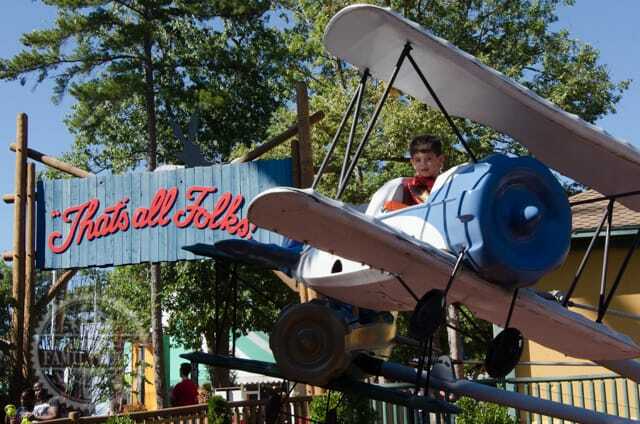 Plus, you have all the rides and attractions, which include multiple areas for the kids. So we were confident there would be enough for the kids to do. We arrived around noon and were starving. (Maybe we should have gotten something to eat on the road). The grim reaper was waiting to welcome us at the security screening area. It was an unusually warm day for late September. It would have been absolutely perfect if not for the fact our kids were wearing Halloween costumes! It seemed like they were the only ones dressed up. 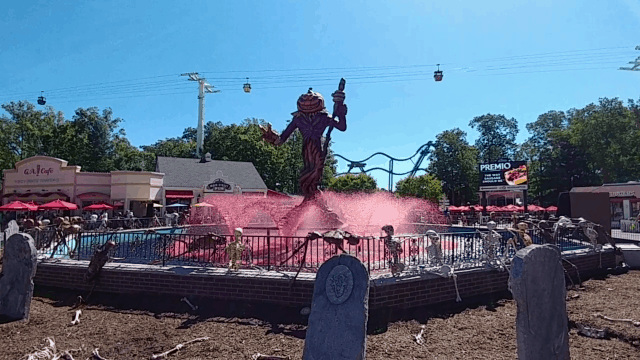 Our first taste of Fright Fest was the blood-red fountain adorned by skeletons and watched over by a pumpkin king. It reminded me of the Nightmare Before Christmas. I couldn’t wait to see what it would look like at night if it was dark when we left. The Trick-or-Treat Trail was just a short walk from where we ate lunch. The trail was decorated with inflatables, hay bales, pumpkins, cobwebs and backdrops for character meets. We had a couple of trick-or-treat bags in my backpack, but they weren’t needed. There was one station right after you entered where they handed each child a candy bar. 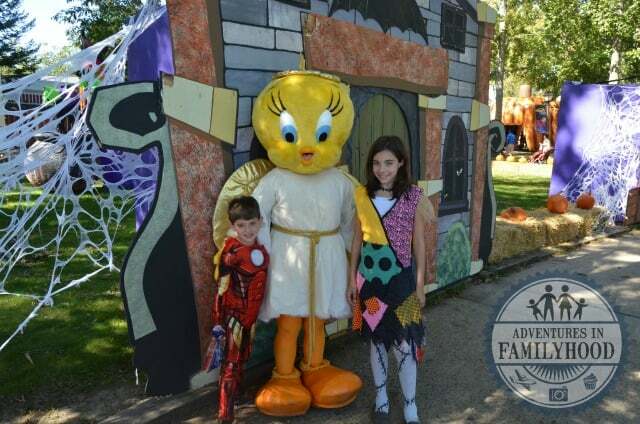 We met Sylvester the Cat and Tweety Bird on the Trick or Treat trail. The trail experience was a good start to the day. We had seen other characters on the trail while eating lunch, so we made a mental note to try and stop by later to see if we could meet them. I think that ideally, you should plan to walk through the trail at least twice or even more to make sure you catch all the characters. A dance party was being held at the fountain when we came out, so we walked back over to take a look. After some hesitation, the girls joined in and had some fun dancing along doing the Cotton-eye Joe and the Hand Jive. 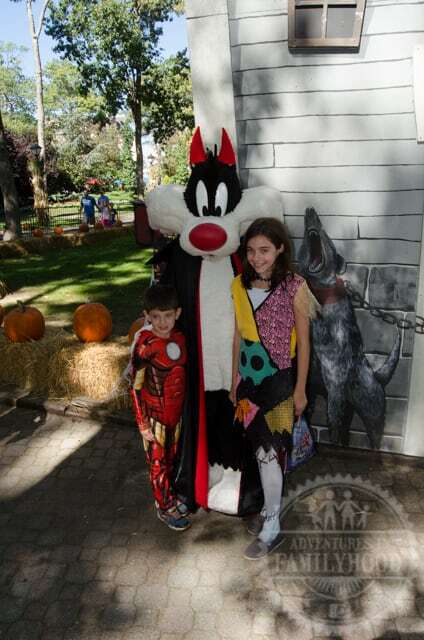 We didn’t see any other Fright Fest shows coming up on the schedule, and Bella and Jackson wanted to do some rides. So, that’s what we did next. There were some rides we could all go on, like the carousel and teacups. But there were a few that were just for the kids, and even some that Jackson could go on that Bella could not. And the lines were not long at all for a Saturday. A few times, Lisa and the kids told me I could take off and go on a roller coaster if I wanted. But I figured I could do that another time. 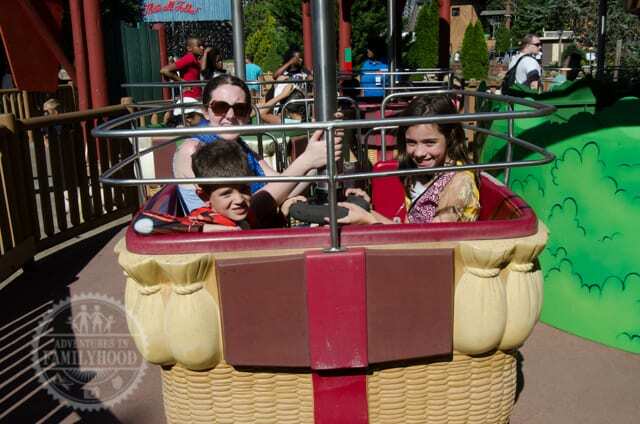 Instead, the only time we split up was to take the skyride across the park to do some other rides. Bella and Lisa opted to walk, instead. They actually beat us there. We got a great view of the park, though. Fright Fest actors arrived and wandered around the tables while we ate, pausing for photo ops and giving mild scares. In the daylight, we saw how intricate and detailed the make-up and costumes are. Some were complete with props. Seeing the actors up close and personal was really cool, but Jackson didn’t like it when they came too close. He became visibly frightened and we thought that perhaps we’d have to leave the pavilion early. The actors were great about giving him his space, and one of the less-scary actors came over to talk to Jackson. We weren’t the only family with children there, and I was pleased to see they were mindful of that. While Jackson was put off by the actors, Bella was actually excited to see more. She wanted to get made up and be one of the actors. She was even thinking of giving one of the haunted trails a try before we left. 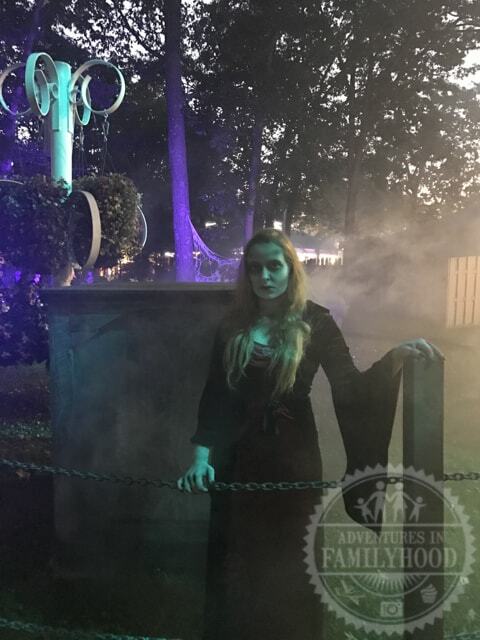 As we went back into the park with just an hour before the “Frights by Night” began, some staff gave us the low-down on what was going to happen. They even told Jackson he could say “Zombie, be good!” to anyone who came close to him and they would leave him alone. Armed with this info, we made a plan to see the parade of zombies and follow them into the arena for the opening show. From there, we’d cross the park to the Lady of the Lake cemetery for Bella to walk through and see what she thought. By that time, my brother should be at the park and we could leave knowing Monica wasn’t by herself. We ended up missing the parade because we tried to squeeze in a ride on the bumper cars before it began. The parade is not long, as it makes its way from the fountain to the arena. We were told to watch the parade from right outside the arena so we could go right in and get the best seats for the show. Instead, we made it into the arena just in time for “The Awakening” show with a side-view of the stage. This show told the story of how a young farmer became Dr. Fright. There is music, some dancing, and a creepy narrator. Eventually, all the zombies file in from the sides to await Dr. Fright. There is a viewing area from right in front of the stage that would make it seem like the zombies are all around you. Obviously, we weren’t in it. But I think Bella might have been game to sit in there had we been on time. There were a lot of people in the crowd who were very into the show. There was a loud scream when Dr. Fright came out. It was like a celebrity had just walked on stage. 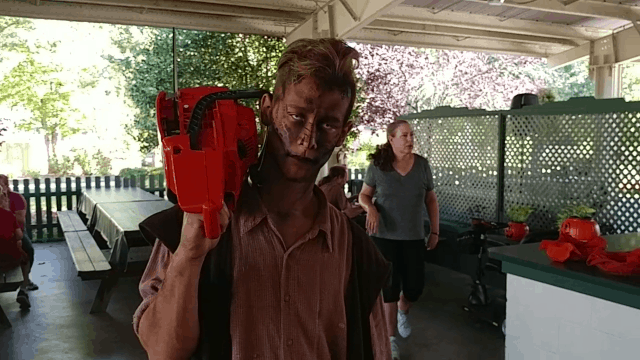 When he gave the command for the zombies to go out into the park, a good number of guests got up from their seats and ran out to be the first ones out there with them. 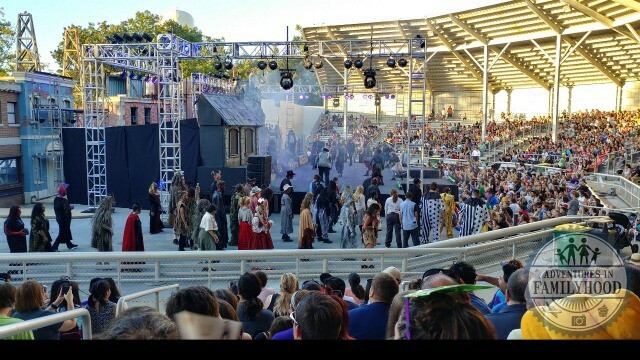 With so many people leaving the arena, we were able to move over to get a better view of the next show, “Dead Man’s Party”. 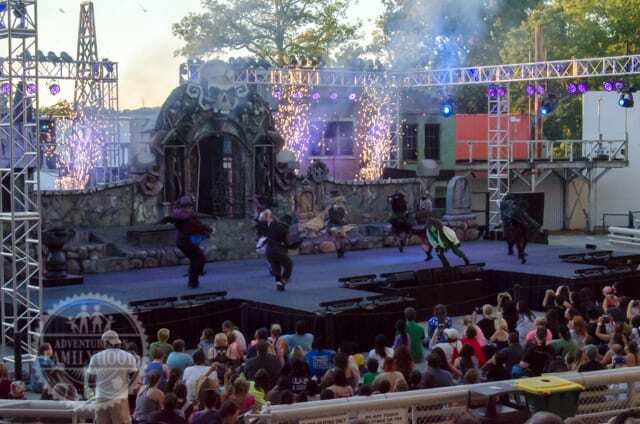 This is a 20-minute show where the zombies dance to rock songs. It’s good for families because it’s fun and you can enjoy it from a distance if you have someone who isn’t so sure about being close to the action. And since it’s not a party without food, after we left the arena we went to get a snack at a nearby stand. 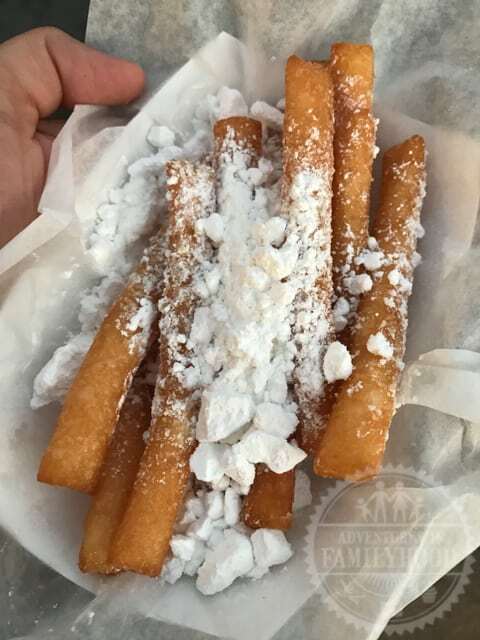 Funnel cake fries… yum! While we enjoyed our snack we could see and hear occasional screams from guests being scared. There were a number of fog machines pumping out mist to add to the excitement. It was still light out, so it didn’t seem as bad as we thought it would be. We talked it over and decided to stick with the plan. So, about an hour into Fright by Night and we were doing fairly well… but the sun hadn’t set yet. Up to this point, I’d say we were all fine, even if Jackson was mildly scared by some of things he had seen. 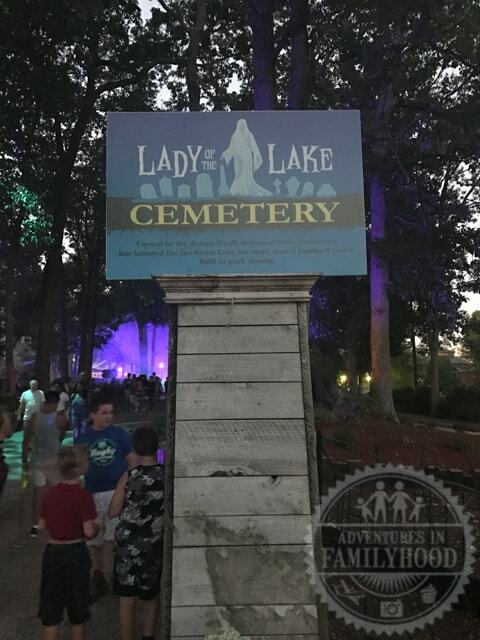 We began to make our way to the Lady of the Lake Cemetery. It was a lot more crowded now than it had been earlier. 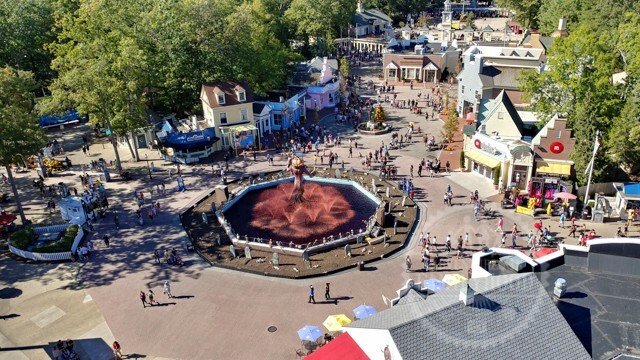 The park map had some scare-free zones marked (kids areas), but totally avoiding the chaos was going to be impossible. I guess that’s why they recommend leaving before 6pm. Bella saw one of the actors from earlier, and went to get a picture. I was waiting with Jackson. Suddenly, there was the sound of a chainsaw, people screamed and ran and as they passed us, we saw the guy wielding it. Jackson was terrified. We tried to move, but there was nowhere to go. The thing about this part of Fright Fest is that it’s a free-for-all. You can only do so much to avoid the zombies, and they may well take it easy on you if you are small. But it’s easy to get caught in the crossfire as the people there because they want to get scared will not care if they run into you and bring the zombies with them. Jackson could have yelled “Zombie, be good!” until his throat was sore, but it wasn’t going to do any good. I do not scare easily, but as a parent, this was my nightmare. I knew there was no danger, but Jackson wasn’t going to believe me when everything he was seeing said the opposite. Getting him away from it was the only thing I could try to do. But I didn’t want to go too far and lose the girls. Thankfully, they spotted us. We made our way out of the area and towards a less crowded part of the park. Jackson was still shaken, but Bella was doing okay. We made it to the Lady of the Lake Cemetery without any problems. There was no way Jackson was going through the cemetery. So we parted ways with the girls here and said we’d meet them on the other side. It was starting to get dark and we had trouble finding the exit to the cemetery. Where I thought it would be was shrouded in fog. We cut through an arcade to get away from the sounds of people screaming. Unfortunately, the area we ended up in had killer clowns chasing people. So we retreated into a gift shop to wait it out. Being inside took Jackson’s mind off what was going on. Shopping kept him distracted. A couple of teen girls came running in. One was visibly shaken and kept apologizing and saying “I don’t normally get like this”. I opened the door for a woman with a stroller and a couple of kids. One of the children hugged my leg and thanked me for helping them get to safety. The girls showed up and we heard their story. The Cemetery wasn’t so bad, but in the fog and commotion, Bella had gotten separated from Lisa and Monica. That was enough for her. So, we made our way back to the entrance, using the arcade and gift shops as cover whenever we could, and we managed to get to the front relatively unscathed. We did some shopping while we waited for my brother to arrive. Once he did, he and Monica went back into the park to enjoy themselves and we made our way back to the car. There was a table handing out some candy near the exit, and the kids enjoyed a treat as we started driving home. No scars. No nightmares. We had survived our Fright Fest experience. Now that we’re home, just mentioning Fright Fest to Jackson will get him worked up. He has no desire to go back. Bella is still interested in getting made up to be a zombie, but she’s willing to wait until she’s 16. I think they’d both be willing to return to Six Flags Great Adventure to do the rides they didn’t get to go on, but they’ll skip Fright Fest for now. I’d be down to go back with friends or family that wanted to do all the scary stuff, just to experience it for myself. 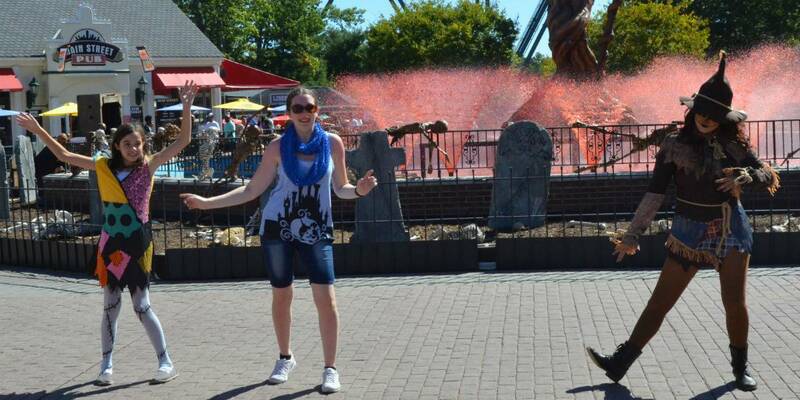 As for doing Fright Fest with kids… it’s doable. Is it worth it just to go during the day? Well, I wouldn’t pay full price for admission to only be there for half the day, and I certainly wouldn’t drive 2+ hours to get there just to trick-or-treat for a candy bar or two and see a magic show or some decorations. The longer you can stay, the more it becomes worth it. Getting to see those two shows made me feel like I experienced a small part of Fright Fest. And things certainly would have been okay had we left right after that with no zombie encounters. That all being said, if you have a season pass or discounted ticket and you are local… it’s not a bad way to spend the day. 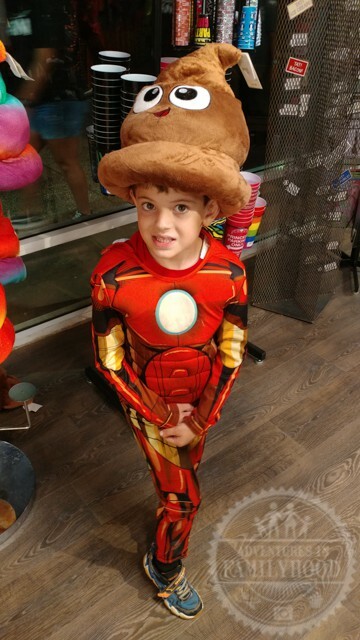 You can enjoy some rides, a little bit of Halloween fun (do the trick-or-treat trail multiple times to get the most out of it) and call it a day before you have to hide in the gift shop. And on the plus side, with a late breakfast/early lunch before getting into the park, and leaving before dinner, you could get by without spending a lot of extra money inside. Just splurge on those Funnel Cake Fries!! 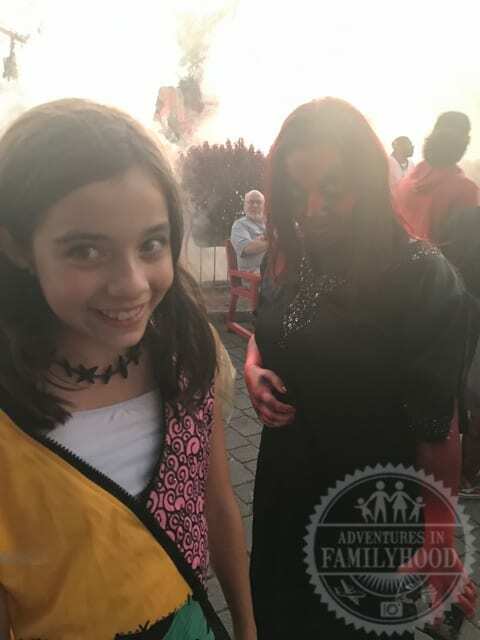 Have you taken your kids to Fright Fest? Let us know about your experience! Leave a comment below!